I’ve had the pleasure to spend the last 24 hours with Dave Houston who hails from the Florida Keys. Dave is a former owner of a St Francis 50 catamaran (SV O’Vive). Dave drove from the Florida Keys to help move our boat to the boatyard. 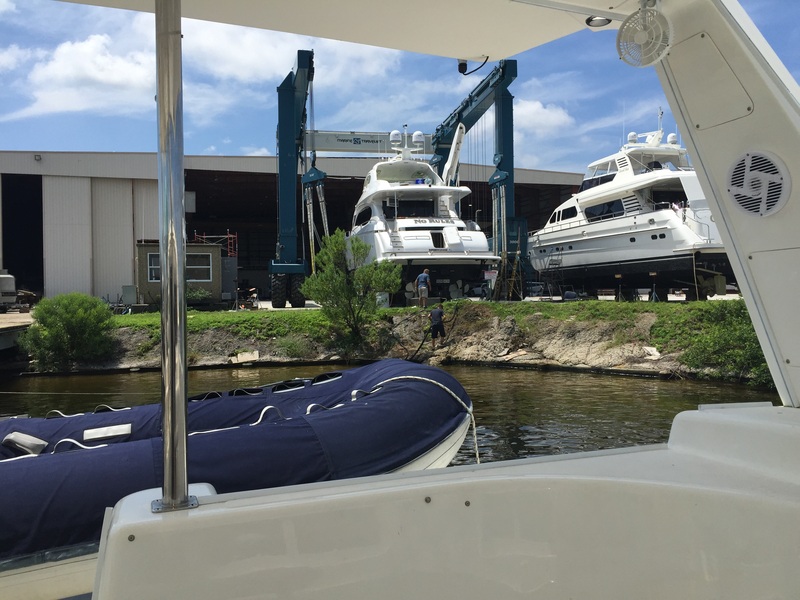 With its marinas and industrial-looking dockyards, Florida seems to be a hotbed for people with marine awareness. Dave is a veteran sailor and I value his expertise and boat knowledge. Dave was capable of sailing by himself when he was 11 years old. He says he had liberal-minded parents. As an adult, Dave has owned three different catamarans and has crossed the Pacific Ocean with his family. I asked Dave – how do you know when you are ready to attempt a crossing of this sort? Dave says that it’s difficult to put into words. You just know. I also asked how his wife felt about the crossing and how she knew it was okay for them to embark on the journey. “She trusts me.” Dave replied. 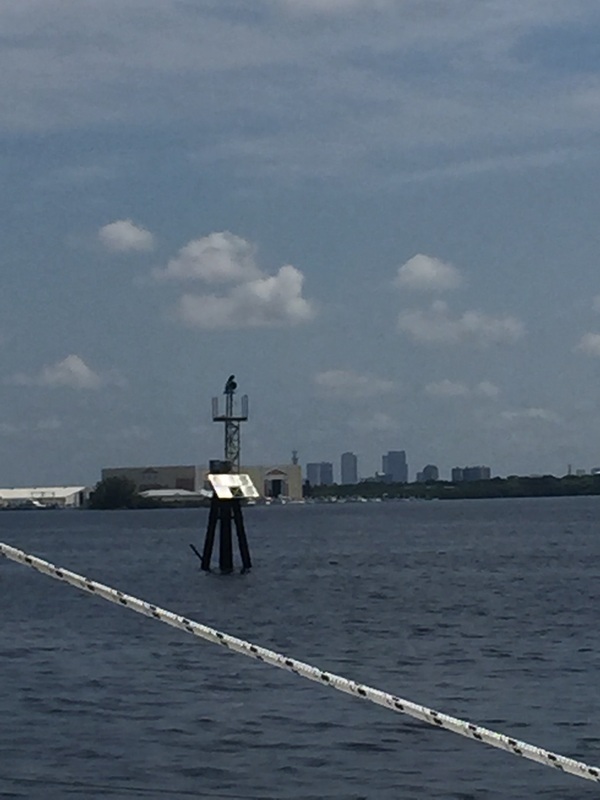 This morning we set off to motor SV Aphrodite to the RiverHawk boatyard in Tampa. Between Dave and myself – our skill level and experience couldn’t be more different. For me, just pulling away from the dock was exciting. I enjoyed the sunshine as it bounced off the surface of the water, and the different perspective that being on a boat offers. 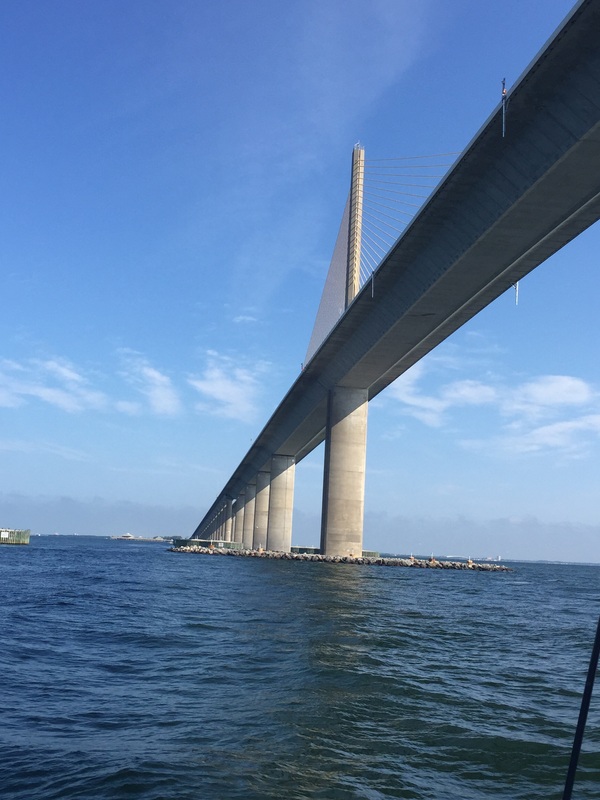 On our boat I could look up at the underside of the Sunshine Skyway Bridge as vehicles sparkled above. I saw pelicans, dolphins, and was given lots of opportunities to steer the boat and watch for hazards. To me, the marine environment feels like an alien landscape. There are different creatures here in Florida. For example, a small black crab skittered out from beneath one of our fenders this morning. And there are strange-looking markers in the water. Some of the markers look like tree houses. Each one serves a purpose. Here is an example. Skeletal cowboy or transit marker with solar panels? Over dinner last night Dave offered me some valuable advice. He said that sailing skills will take my family as far as we want to go, but he cautioned that all water can be dangerous. The Caribbean – for all its warmth and a prettiness – should not be considered to be a safe haven. Boating accidents can happen anywhere. That said, he pointed out that, all sailors – experienced or not – have a starting point. No one is innately born with sailing language or skills. Every sailor had to learn sometime. I am at the starting point of the learning curve. And, it is a little intimidating owning a boat, and being a beginner. I bought my car in much the same way – before I had my full license- and was apprehensive, at first, to drive that too. My husband, Rick, arrives tonight from Ottawa. Tomorrow, our boat will be hauled out of the water for a few days to allow for painting and some repairs. Hi Lorraine. I heard the CBC interview and my ears perked up immediately. How wonderful for all of you. I will follow your blog with rapt interest. Great to be in touch again. Laurie – it’s great to hear from you! Thanks Mary! Let Evelyn know that the mermaid that you gave to Betty has arrived safely. Betty will arrive this weekend with her siblings and we will send pictures! Thanks again for visiting my blog and for your kind words.